All parts coming in contact with the product and packing material will be stainless steel 304. Reel feed arm with compensator. SS Hopper with vibratory feeder. aluminum cone moving at 1½ time to feeding disc. Cross sealers with zig-zag knives. Drive motor: AC motor with AC DRIVE. .
b) 2 nos. Proportional type temperature controllers. e) Contactors and starters for motor and heaters. f) AC DRIVES 2 HP. 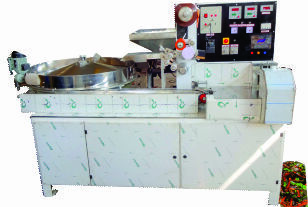 Machine speed: The machine will have a speed of 1000 to 1200 packs/min; depending upon the product, finish and packing material, room to be maintained at 22 deg. C and RH 50.